Whisk started life as a digital platform that was on a mission to help people find and save new recipes online. Five years on, the company has 20 employees based all over the world, and they’ve evolved into a B2B business that helps the world’s leading brands to create data-driven digital food experiences. Having recently secured a major contract with Samsung to power their Home Hub and IoT ecosystem, winning other major clients like BBC Good Food, and making big moves into the US market, Whisk need to completely overhaul their brand and proposition to better suit their new direct to business approach, and set them apart from established competitors in the space. Just like Notepad, Whisk are an entirely remote team. They use tools like Google Hangouts, Slack and Sketch to work collaboratively from multiple countries and time zones. At their most recent annual retreat, Whisk had spent the day exploring and refining their new brand proposition and vision for the company. Building upon this foundational work, our aim was to create a unique identity and set of tools that clearly communicate who Whisk are, and what they stand for. 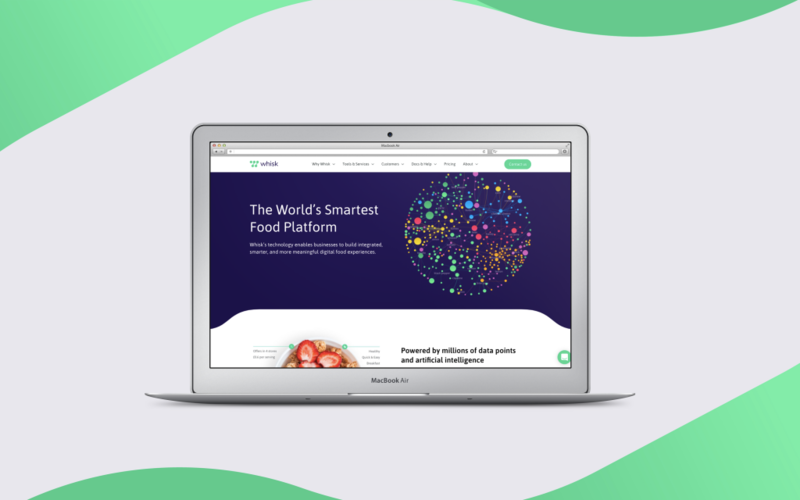 Whisk’s competitive advantages in the marketplace are their unrivalled understanding of breadth of food data, their world-class partnerships, and their own in-house cutting edge technology. Their new proposition sums this up in a way their target audience will understand, and positions them as the best solution in the market. With the proposition nailed down, we then created the tagline ‘Smarter food experiences’ to sum up the key benefit of working with Whisk, and showcasing their new focus on helping to power smart technology. As with the strategy and articulation for Whisk’s brand, we knew their new brand identity needed to showcase the right balance of tech and friendliness. As a business, Whisk are all about helping people to make connections. They connect over 7 million data sources to help brands understand people’s online behaviour with food, and they helps brands to better connect with their customers. Instead, we took a completely collaborative approach to creating Whisk’s identity. Once we’d outlined a general look and feel and nailed the logo, we handed over the raw files to Whisk’s design team and let them go wild. We then iterated on their work, and passed it back again. This carried on until everyone was truly behind the new identity and completely understood how it worked. The duotone design of the abstract W logomark helps to visually communicate ideas of connection, and data processing. We then applied this duotone approach and rounded visual style subtly across the brand’s various touchpoints to create a completely connected brand identity that’s recognizable, future-proof and ownable. As an entirely remote business working in multiple timezones, it was important all of Whisk’s team had the confidence and understanding to use and promote the new brand across all departments. As well as presenting the new identity to Whisk’s global team via Google Hangouts, we created an easy-to-digest playbook for the brand. Detailing how to correctly use all elements of the brand, the Whisk Playbook ensures consistent communications across the entire business. Further to this, we created quick-reference one pagers for the core elements of the brand identity and brand strategy, to ensure the Whisk team has rapid access to the most important elements of the brand whenever they need it. We then worked closely with Whisk’s design team help guide the design of their new website. To find out more about what it was like to rebrand a company without actually meeting face to face, read this blog or take a look at the video interview below.